Decadent and cheesy, this classic comfort food is sure to warm your heart and soul. It truly is the best baked macaroni and cheese… and it can be made completely ahead! Guys, Fashionable Foods is turning 4 this month! My first post was published on November 10, 2013. Where the heck did the time go? I can’t believe I’ve been sharing recipes for almost 4 years! Time flies when you’re having fun. ? To celebrate, I’m doing something a little different for the month of November. Welcome to my make-ahead meals series! Back when I started this blog, I did “Make-Ahead Monday” posts where I shared a make-ahead recipe. Some were completely make-ahead and others were partially make-ahead… meaning most of the prep work was done ahead and then there were just a few finishing touches to do when you’re ready to eat. So, that’s how this series is going to go.. some will be completely make-ahead and freezable, and others will be partially make-ahead. Think meal prep-ish. I even have some make-ahead holiday recipes up my sleeve. 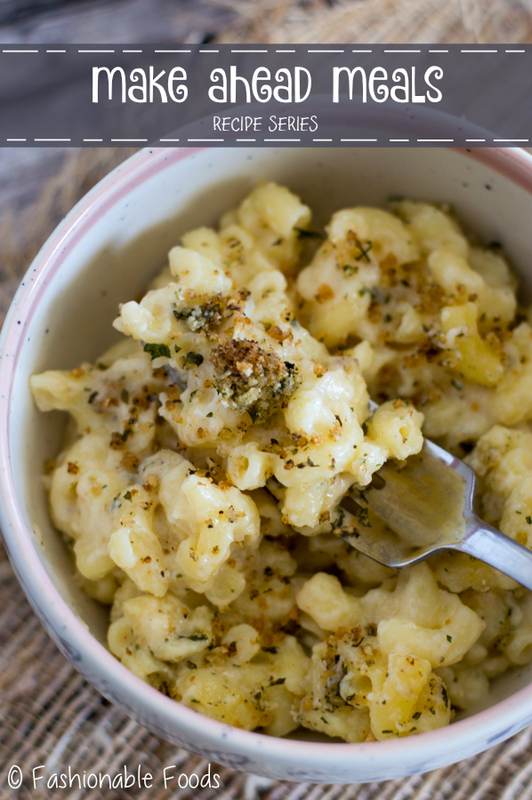 First up, we have my absolute favorite make-ahead recipe… Best Baked Macaroni and Cheese. 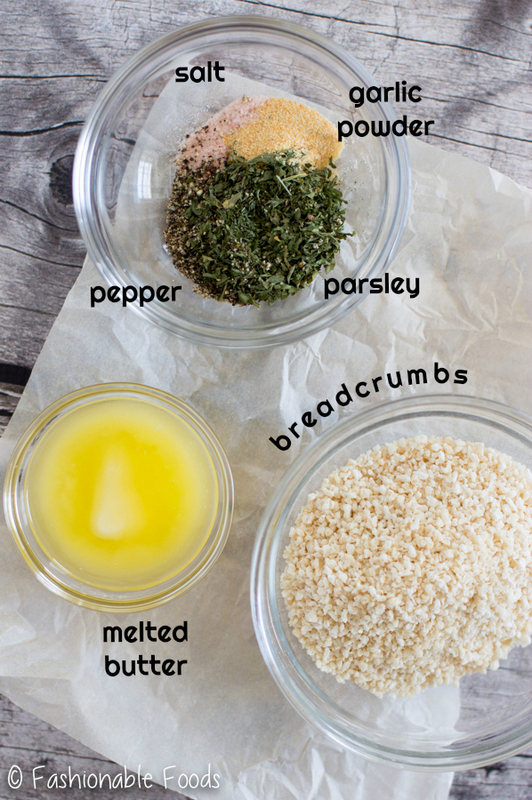 *Note: This recipe was originally shared in February of 2014. I’ve updated the photos and the text, but the recipe has remained the same. 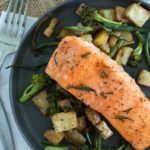 Back when I started this blog, I couldn’t wait to share one recipe in particular. Yep, you guessed it… best baked macaroni and cheese. 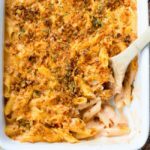 I was so excited to share it because it’s my favorite comfort food and my go-to need-to-feed-a-crowd meal. 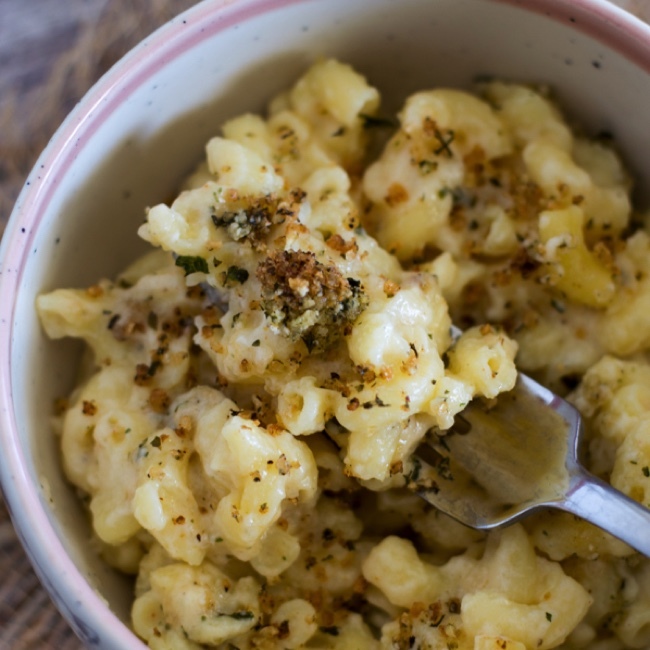 Seriously, who doesn’t love mac and cheese? Claiming it’s the “best” is obviously a bold statement. But, to me, it really is the best because I’ve spent years perfecting this recipe. I’ve tried many different cheeses, flavorings, and methods. Over the years I’ve learned two important things: cheddar is a must and there is no lightening up macaroni and cheese. 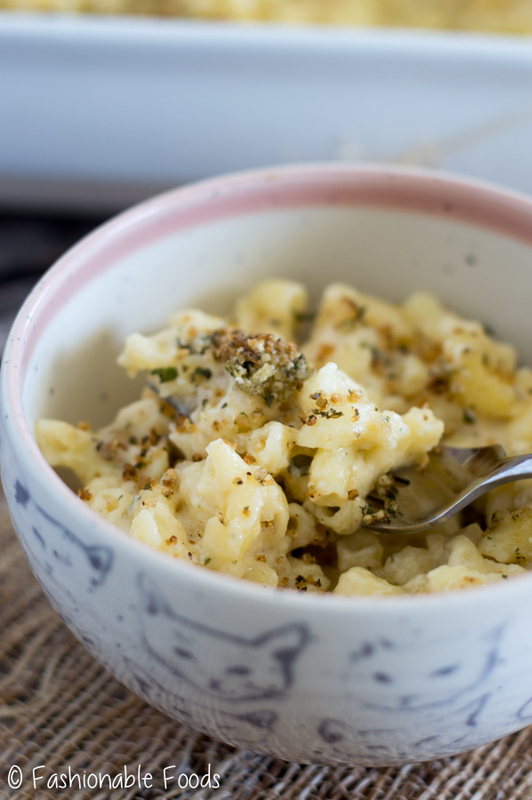 Ok, so there is lightening up mac and cheese. But, I don’t recommend it for this particular recipe. Trust me, I’ve tried. Low-fat milk doesn’t have the same richness.. less cheese leaves it lacking that extra cheesy factor.. and low-fat cheese is a big NO in my book. There is room for comfort food in any healthy diet; eat it sparingly and keep your portion in check! This definitely isn’t something you eat very often, so when you do, you want it to be good. So, dieters beware – this one is rich and cheesy, as it should be. ? For a while I was strictly using cheddar cheese, which is fine, but I always felt the sauce lacked silkiness that I wanted it to have. I decided to add a mild, creamy cheese and see if that would do the trick. I chose a mild Havarti, which is a semi soft, buttery cheese that melts beautifully. This wonderful cheese combined with good quality, sharp cheddar creates an amazingly flavorful, silky sauce. The egg is a very important component of baked macaroni and cheese. It acts a binder, but also thickens up the sauce slightly so that you don’t have to use too much flour. Too much flour gives an odd mouth feel and texture, so I don’t like to use more than I have to. One egg is perfect here as it provides the perfect custard-y texture without being too stiff. 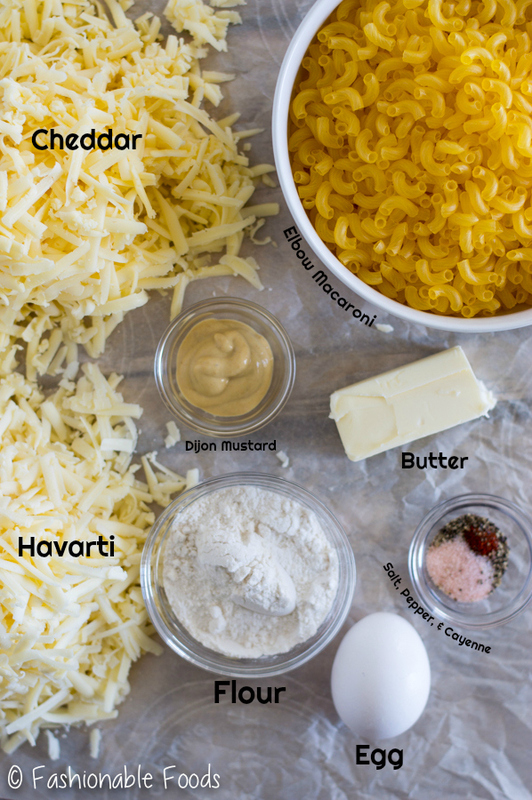 I have played around with different flavorings for my macaroni and cheese, from onions to different herbs and spices. I’ve learned that the cheese should be the star and the only added flavors should be those that enhance the cheese. My two favorites are Dijon mustard and cayenne pepper. Dijon mustard goes so well with cheese and adds great flavor, but isn’t overpowering. Cayenne pepper is a recent flavor discovery for me; used in small amounts it can really enhance sauces and soups. You won’t get heat from it, just a nice warm flavor in the background. 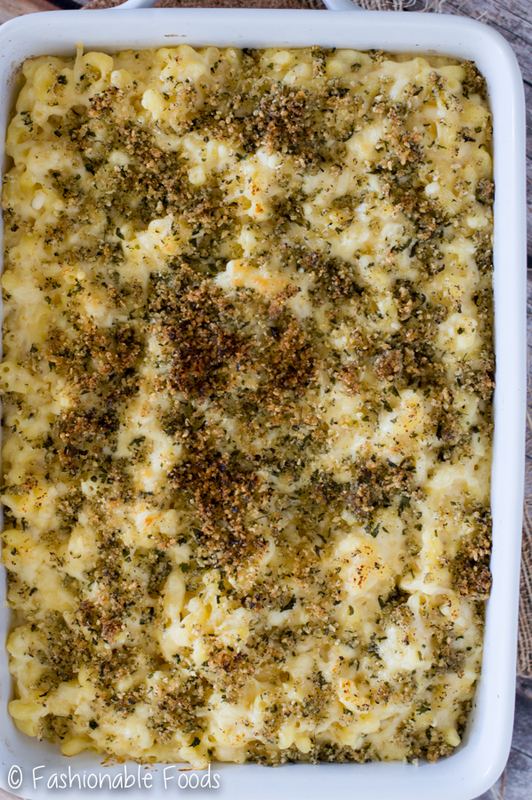 Top off this wonderful macaroni and cheese with buttery, garlicky, herby breadcrumbs. 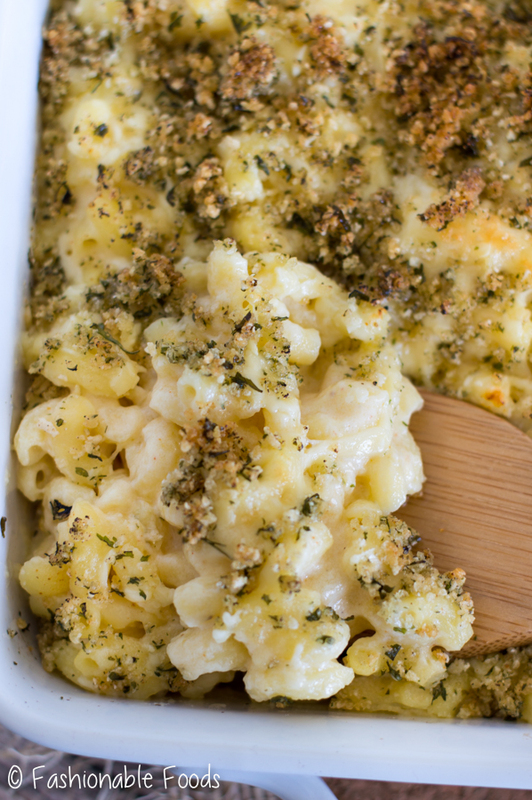 The breadcrumb topping is what takes this mac and cheese to the next level. Crispy, buttery, and full of flavor.. it’s a must! Once you’ve got your pasta cooked, sauce made, and topping ready, you’ll assemble and then either bake or pop it in the fridge or freezer. If you’re making it ahead for dinner, you can refrigerate it up to 48 hours. If you want it for another week, simply cover it and pop it in the freezer for up to 6 months. When you’re ready to bake, just take it out of the freezer, uncover, and bake it for about an hour. I could talk all day about my macaroni and cheese, but I’ll stop here. It’s the best baked macaroni and cheese. End of story. ? In a large pot of boiling, salted water cook the pasta until al dente. Drain and set aside in a large bowl. In a large pot, melt the butter and then sprinkle the flour over top. Whisk it until smooth and cook for 1 minute. Add the Dijon mustard, salt, pepper, cayenne, and parsley. Slowly whisk in 3½ cups milk and cook over medium heat until the sauce thickens, whisking occasionally, about 8-10 minutes. In a small bowl beat the egg and then slowly add a small amount of the béchamel sauce, whisking vigorously. This is known as tempering, which brings the egg to temperature without it scrambling. Pour the mixture back into the pot and whisk for 1-2 minutes. Remove from the heat and slowly add most of the cheeses (reserve 3/4 cup of each cheese), a handful at a time and allowing each addition to melt into the sauce before adding the next. Pour the sauce over the cooked pasta and mix well. 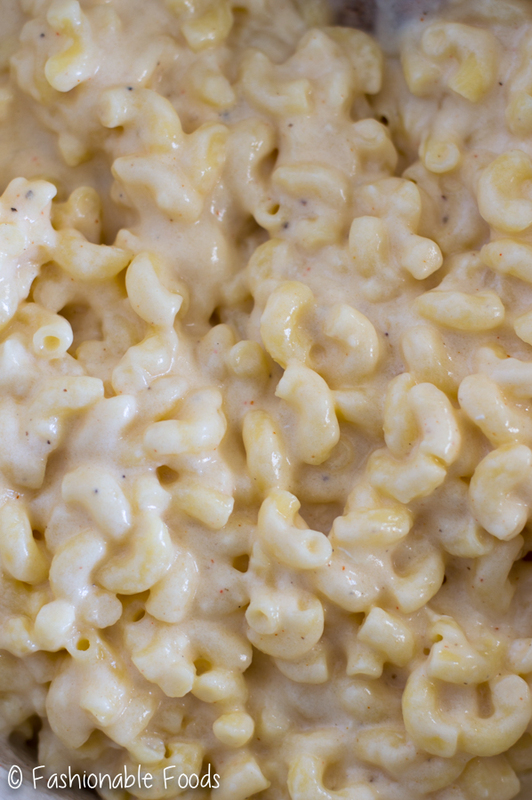 * Pour the macaroni and cheese into a 9x13 inch-baking dish and top with the remaining cheese. Bake at 375º for 30-45 minutes* or until golden and bubbly. *If the sauce seems too thick and you plan on making this ahead, add the additional ½ cup of milk to help loosen the sauce. 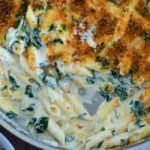 This will keep it nice and creamy and account for the additional time it will sit in the fridge or freezer. I've found that gluten-free pasta tends to soak up more of the sauce, so I always need 4 cups of milk, and sometimes more. For regular pasta, 3½ cups may be enough! *If frozen, add an additional 15-20 minutes to the bake time. This looks yummy, I love baked macaroni and cheese! Love the spiral noodles you used! This looks amazing! When you do the make ahead, do you assemble all of it except for the breadcrumb mixture, then freeze it? Only bake once, for an hour when you take out of the oven? Should be breadcrumbs not be added until the 2nd half hour then? Thank you!